Note shielded cable (3 wires) and seperate twisted pair of wires (one connected to ground). The four gromets that attach each sensor are connected to ground. Ground lug and top large white wire at left are both ground. MILES (Wiki) is the military version of Laser Tag (Wiki). 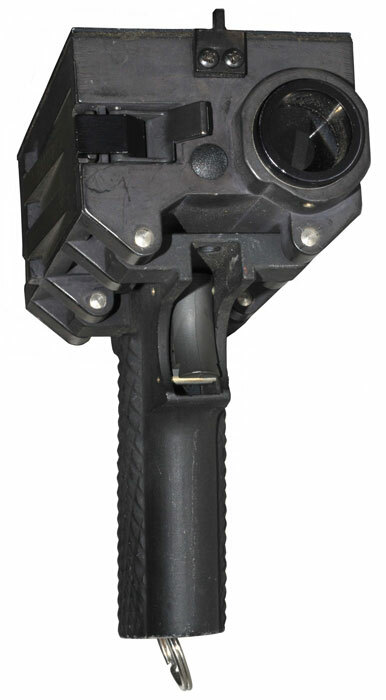 A laser is fitted to weapons which fire blanks. Vehicles and soldiers are outfitted with sensors. When one of the sensors detects a laser (with coding) it signals a hit. 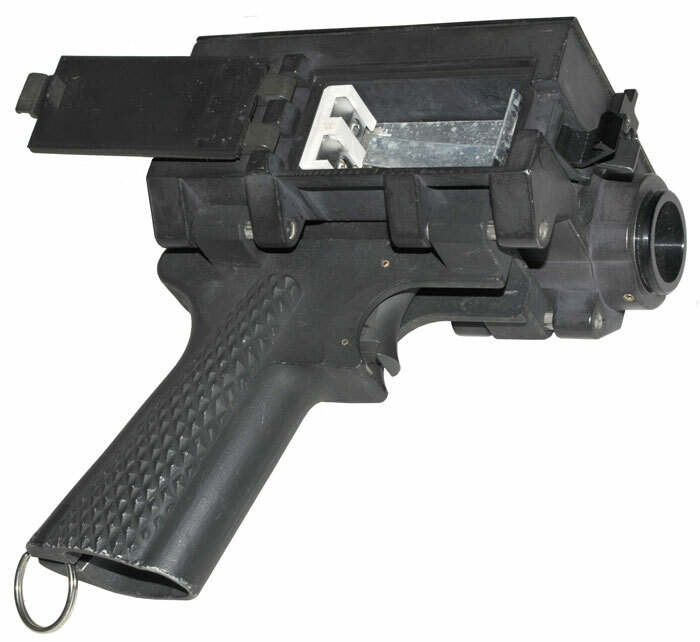 Laser transmitter connected to and boresighted with the weapon. The range of the laser is about the same as the real weapon. 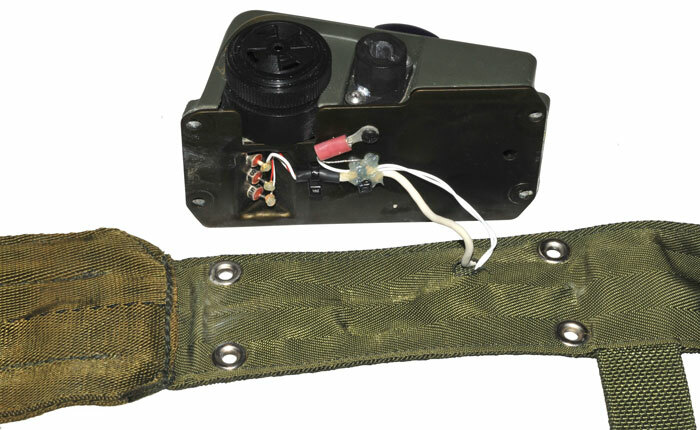 Laser receiver for the platform and/or soldiers with audio and visual alarm indicators of near missis and hits. 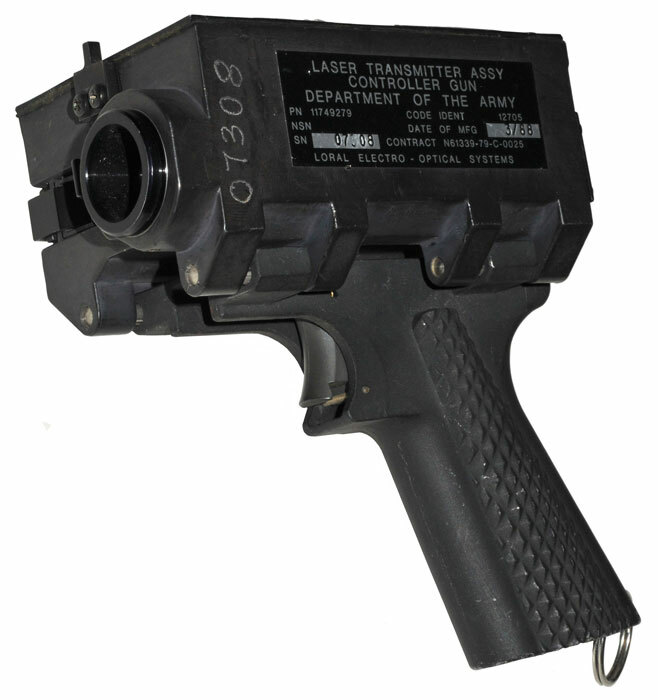 This is a Laser Transmitter Assembly, Controller Gun, p/n 11749279, NSN 1265-01-092-0891. Firing LED, Man Kill button and Universal Kill button. This is device used for testing the sensors, it's not used during a MILES exercise. I confirmed that it's working by using the Electro Optical Gadget that's a photo diode feeding an audio amplifier. It makes a buzzing noise when the trigger is pulled. If while the trigger is pulled wither of the rear panel buttons is pressed the sound changes, so they are also probably working. When only the trigger is activated the controller gun sends the "near miss" code. When the trigger is pulled and one of the butons is pressed the gun sends either the "man kill" or "universal kill" codes. The green key is usually clipped to the ring and is used to reactivate the laser transmitters. Note the CAUTION label says this is NOT an eye safe device, i.e. you need to wear IR blocking glasses when using it. Can be used to turn off alarm on MWLDA and other sensors. It does fit the key socket on the box for the MWLD. Is intended to be carries on the split ring on the handel of the controller's test gun. Small Arms Transmitter (SAT) activation key. When the SAT is activated it allows for a fixed number of "shots" then the transmitter no longer works. Alarm deactivation key for armor and aircraft sensors. p/n 2030360 is the new version with built-in Lithium battery. But it does not have provision for use of the Green Key. 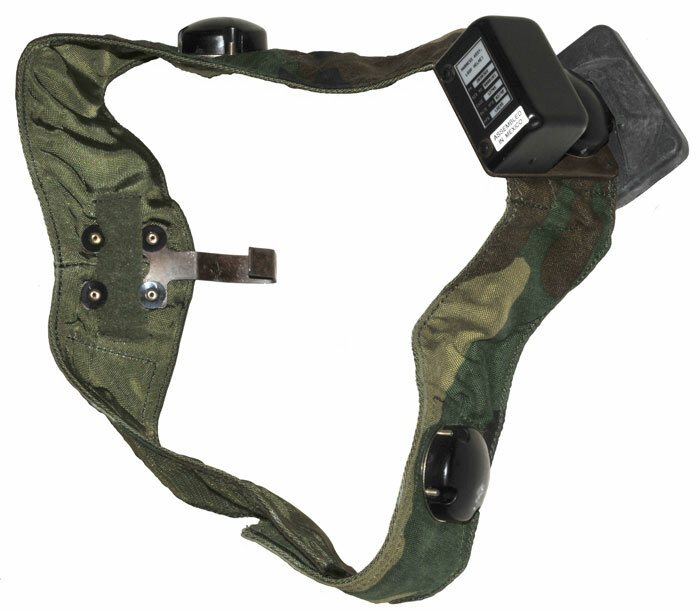 The rubber part on the helmet worn sensors is an inductive coupling that works with a coil wound in the torso harness that's located near the shoulder. 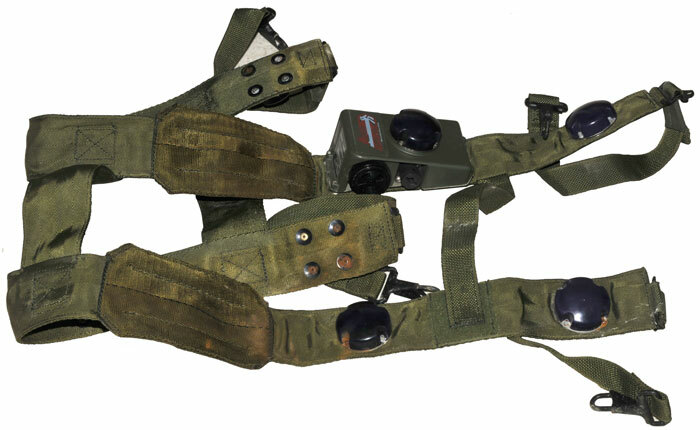 When the helmet sensor belt is within about a foot of the shoulder area of the torso sensors they automatically couple toghther. 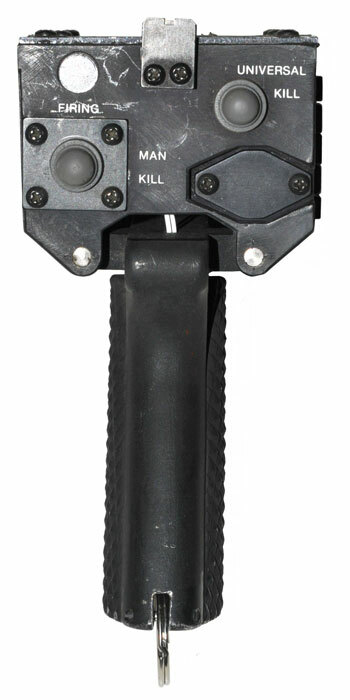 The Green Key when used on the MWLDA resets both the torso and helmet sensors. TM 9-1265-370-10-1 gives the p/n of the MWLDA as 11748808 but the one I have is marked as p/n 2013160-1. It may be that p/n 11748808 is for the combination of the torso and helemt sensors and there are different p/ns for each. The p/n 11748808 MWLDA has a simple battery box for a 9V battery, but not p/n 2013160-1.
p/n 2013160-1 is a much newer version of the older p/n 11748808. The new version has a built-in Lithium battery that lasts much longer than the 9 V battery used with the older version. Each system includes both the laser and sensors for the platform. 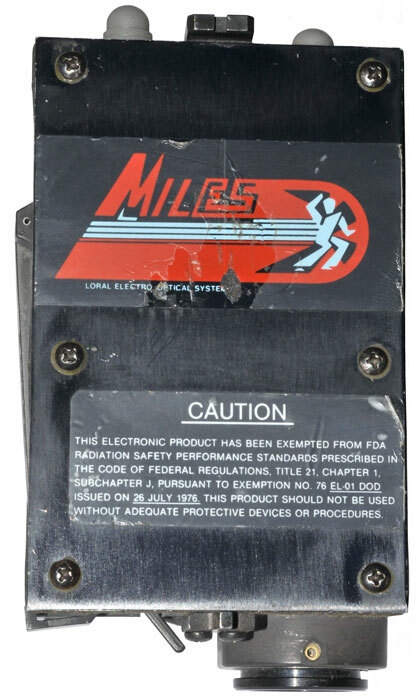 I expect there are a number of movies where MILES equipment is shown, let me know what they are. Heartbreak Ridge 1986 (IMDB) - has a few scenes where MILES is mentioned and shown in a training exercise. 3220732 Electronic apparatus useful in simulated gunfire and simulated rifle ranges, Pincus Martin S, Nov 30, 1965, 463/52, 446/485, 361/175, 362/112, 327/365, 340/384.3, 315/227.00R, 446/405 - solenoid in rifle simulates recoil, rabbit target. These patents, all Joe W. Kimble, seem to embody the MILES system, but I don't know if they actually apply. There are a large number of patents that reference these. 4352665 Small arms laser training device, Joe W. Kimble, Edsel E. Dotson, Cerberonics, Inc., Oct 5, 1982, 434/22 - MILES discrete & ICs. Includes near miss and shot counter. 4823401 "MILES" transceiver display controller unit, Rudolph R. Gammarino, Mark S. Doerning, Barry J. Cuccia, Applied Solar Energy Corporation, Apr 18, 1989, 398/128, 362/112, 89/41.06, 434/21, 398/135 - Pistol, see Fig 1,2, & 3 above. 5426295 Multiple integrated laser engagement system employing fiber optic detection signal transmission, Himanshu N. Parikh, Fritz W. Healey, Cubic Defense Systems, Inc., Jun 20, 1995, 250/227.11, 250/551, 434/22 - MILES sensor vest + other sensors. [an error occurred while processing this directive] page created 14 July 2010.